AUTOMOTIVE NEWS: Are Mitsubishi dealers clamoring for a pickup? JOE BIZZARRO: Doug Baum has Lewisville Mitsubishi [in Lewisville, Texas,] and the potential that he sees with this truck in his area is huge. So he brings that to the board all the time. When I’m out at meetings, people do talk about it, but not everyone. It’s a missed component to our success, I believe. Mitsubishi Motors North America is growing in the U.S. and just tallied its second consecutive year of 100,000-plus light-vehicle sales and best sales results since 2007. 2018 sales were 118,074, up 14 percent. 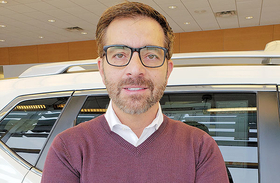 Joe Bizzarro, chairman of the Mitsubishi National Advisory Board, attributes the brand's sales success to Mitsubishi having doubled the number of dealership zones to four and new executive management including Mitsubishi Motors North America CEO Fred Diaz. Bizzarro, a Mitsubishi dealer for a decade, touted the brand's vehicle dependability, pricing, warranty and added technology. He called the vehicles the "country's best-kept secret." "The more we sell nationally, the more that we're going to get product, advertisement, recognition, which in turn is going to drive in more customers and brand awareness," he said. Bizzarro, 47, is dealer principal of Interstate Mitsubishi in Erie, Pa. He spoke with Staff Reporter Melissa Burden in December. Here are edited excerpts. Q: What is missing from Mitsubishi's product lineup? A: I really like a smaller lineup because you can focus more on those. But one thing that we're missing is that small truck. I believe we had it from 2005-2009, that Mitsubishi Raider truck. That's one piece that we're missing. When we had the truck, I did really well here in the Northeast with it and still people today say, "When are you going to get a truck?" Has Mitsubishi indicated that something is coming? I know that depending on our sales and what we do, I know that we will get product. So it's kind of a yes-and-no thing. I think that now with Mr. Diaz taking over, he sees the potential with this brand. And once we start continuing to lift the numbers, I believe that, yes, we will get product. I believe they're talking about it now. Overall, how was 2018 for Mitsubishi dealers? How has the automaker's involvement with dealers been? I think some months we were up, some months down a little, but we're pretty even on pace from last year. The involvement of the Mitsubishi executives is huge. I mean they get right involved with dealers. They're very much involved in everything that we take to our national advisory board. If there are ever requests for a dealer to talk to Fred Diaz or Ken Konieczka [vice president of sales operations], they get right on the phone and they address whatever needs they have. How has communication been with dealers? Has Diaz helped drive dealer engagement? I believe he has. Bringing an American from the U.S. to run the American market and the flexibility that he has [has helped]. We've always had Japanese running our U.S. market from Japan. Fred knows the market. He has a lot of experience in the U.S. and I think he really knows what we need to do to get the job done. And he's engaged. We've had some very intense and very productive NAB meetings, better than ever before. How is the Eclipse Cross selling? The Eclipse Cross is finally starting to make some penetration. I think we had a little soft launch, which really didn't excel the product the way that we wanted to or expected to. But the numbers are starting to grow. And that car speaks to a different crowd than Mitsubishi is used to. That's attracting a more tech-savvy and middle age and up audience. How is the Outlander PHEV selling? When I see some of the numbers and some [dealers are selling] 25, 30 of them a month, I'm very impressed. In Erie, my city's a little behind times. You don't get a lot of people coming in for the plug-in hybrids. We're doing OK. We're probably selling a couple a month here. But I have to give you my opinion. I think the car's doing better than expected. Do customers still want sedans? Is Mitsubishi committed to bringing new versions of the Mirage and Mirage G4 to market? We do have a lot of customers that want the sedans. I think the market has shrunk a little bit. That's why they got rid of the Lancer. I think more people are going to the smaller CUVs, especially in the Northeast. But I think you're going to see them invest in our sedan family because it's not died out as much as everybody's talking about in my area. Dealers have been concerned and have been asking for a leasing product. Was that delivered? We are working on it. No, it hasn't been delivered. But every national advisory board meeting we have, we are chipping away at it. And I think you'll see us be successful here pretty soon. Some Mitsubishi dealers have complained about ordering taking too long and issues related to inventories. How is that going now? That's good. They put a couple programs in play that are helping dealers get inventory quicker. But we still need a little bit more improvement. Along with leasing, those are about the two major problems we face. We are working to resolve it. You figure a dealer has a great month, maybe they sell 20, 30 cars a month and all of a sudden they sold 50 or 60. And now their inventory's low and they say, "Oh, I need this product. We can't get it for a while." Now it kind of slows down the momentum. And then by the time they get the product, their momentum stops. That is recognized and that is something that is being addressed. Have dealers expressed concerns about the future of the Renault-Nissan-Mitsubishi alliance following the arrest of Carlos Ghosn, particularly as it relates to products that might come through a shared alliance platform? Are they concerned? No. I think all the dealers are very excited with the two getting together. I think they only see the positive out of everything. You know Nissan does have the biggest plant here in the U.S. in North America and it does have room to build cars. So I think how we look at it, we know what can be done, so we're just excited and just want them to get it going. As for the Carlos Ghosn thing, I don't even think anybody had a concern over that. It was like, "Oh really, that happened?" And I've never heard about it after that, just that it happened. We know what we got here in the U.S. with Mr. Diaz and Ken Konieczka and we know the direction we're going in and they give us a lot of confidence. We're heading in the right direction. Has Mitsubishi communicated with dealers about the Ghosn situation and what to expect from the company? The day it happened, they knew as much as we did. They did send a newsletter telling us what they knew. It's not going to affect anything with our alliance with them in the future. It had nothing to do with Mitsubishi at all. What do dealers think about the upcoming Mitsubishi products that will be on the shared alliance platforms? Is there something to be excited about? There is. They haven't announced, but we know there's a potential for that. Will it happen? Yes. When or what? I don't know. Are you pleased with the marketing? What do you think about the Las Vegas Bowl sponsorship? I think the Las Vegas Bowl has really shown the brand is strong to be involved with something like that. You always see other manufacturers involved in sports. I think that's a big positive. Our marketing is getting a lot better. When Fred came in, he got more involved in it and he's letting them get more creative. He's helping with that. It is getting better and I know Fred is focused on that. Is Mitsubishi doing enough to promote certified pre-owned sales? They're getting more involved in that, too. Once again, I'm their No. 1 dealer in the U.S. in CPO sales. I try to spread that around to all the other dealers to help them out on what I do. It gives us three lineups. We've got pre-owned cars, we've got certified and we sell new cars. One of the dealers I deal with that's in my area, actually last month he beat me in CPO sales. They're really getting focused. They've got a department. They've got a guy handling the CPO. The only thing is we've just got to get all the dealers involved and focused on it. Has Mitsubishi asked dealers to invest in their stores? If so, how are dealers responding? They let us know it's coming. And the question is, is there going to be support? The answer is yes. And yes, this facility is going to come. [They] haven't sent us anything that says, "OK, Interstate Mitsubishi, you need to get your facilities done at this time." No, they gave us a nice heads-up — this is where we're going, this is the direction, just like they give us on anything else. Regarding facility programs, has Mitsubishi offered financial support for investments that dealers would have to make? I believe that they will. It's in the beginning stages. Is vehicle affordability a concern for Mitsubishi dealers? Our lineup is very affordable and I know they added some technology, especially to our CUVs. But they're keeping that price under control. Our reputation for Mitsubishi, we have excellent reliability, our safety is solid, our standard features are going up, our prices are still better than everybody. Anybody that knows Mitsubishi, if they've owned one, or heard of it, that car has always been a well-built car. I think the manufacturer recognizes that. They know we need to add some technology to the car, but we can't go crazy on price. We've seen a lot of manufacturers that did that and now they're like high-end vehicles, which I think is why you see a lot of these big manufacturers drop in sales because they plushed out their cars too much. But Mitsubishi knows their product. They know what they stand for. So they're going to add some technology, but they're not going to blow up the price. Are Mitsubishi's production and inventory levels in line with demand? No. How we order cars is definitely once again what we're working on. We need to have more cars available. It's hard to get product pretty quick. We're on a three-month ordering system, so what I order today comes in three months, which doesn't work out too well. Are incentive levels appropriate to manage the inventory and production side? Has Mitsubishi made changes to dealership bonus programs? Yeah, we revamped our program. A lot of dealers had a concern at first. But once they looked at it and they moved the needle just a little bit, they have really been on board with it. And what I like about it, when we redesigned this, you're seeing a lot more dealers up in the top 20 to 30 percent that never were in there, because they got engaged. They saw what they needed to do to move the units and they're being successful at it. So everybody's on board, I would say. I would say about a year ago. The program was more designed for the lower-volume dealers to get their volume up. Does Mitsubishi use stair-step programs? Our old program was a stair-step. This is a different program that gets more model specific. When I said it helped underperforming [stores], it helped both. It helped the top dealers like myself push for that extra 10 a month and then took the lower-volume guys that sell 10 to 15 get to 20 to 22. I'm just throwing those numbers out. It helped everybody push the needle. Are the dealers in the lower-tier sales volume happy with the program? They are. A lot of dealers have really hit some levels that they say, "Whoa, I can make some money with this brand."